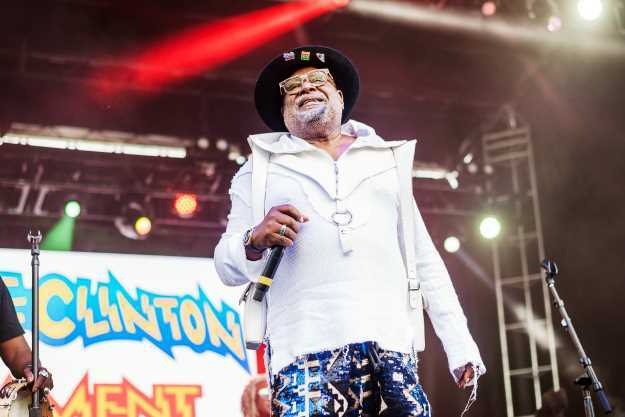 After five decades of life on tour buses and Motherships, George Clinton is ready to retire from the road. The U.S. dates of his long goodbye, which he's dubbed the One Nation Under a Groove Tour, will kick off this spring and run through August. "It's coming right on time," Clinton tells Rolling Stone, saying the announcement is part of a plan he conceived a few years ago. It's the next step after releasing his 2014 memoir, Brothas Be, Yo Like George, Ain't That Funkin' Kinda Hard On You? as well as Funkadelic's 2014 album, First Ya Gotta Shake the Gate and Parliament's 2018 album, Medicaid Fraud Dogg. "I would love to keep on doing this but I'll be 78 in a few more months," he says. "Even though I feel like I'm just getting started, the reality is the group needs to go ahead and keep it going. We've got a new vibe in the band, and they've been carrying it for the last three years. I've been up there representing for people, but they've actually been turning the place out. And we've been selling out for the last five years, every night." The tour, which officially kicks off after Memorial Day weekend (though Clinton is playing some farewell tour dates beforehand), will variously feature openers Galactic, Dumpstaphunk, Fishbone and Miss Velvet and the Blue Wolf. Tickets for most shows go on sale Friday at 10 a.m. local time. Pre-sales will start on February 7th; more information is available at Clinton's website. The Parliament-Funkadelic band features several musicians who have been in the lineup for the last decade, as well as a handful - trumpeter Bennie Cowan, saxophonist Greg Thomas, bassist Lige Curry and guitarist Blackbird McKnight - who have been with the group for 30 years or longer. It also features many of Clinton's descendants. The tour's title recalls both the 1978 album, One Nation Under a Groove, and blockbuster single of the same name. Clinton says the song's message of unity is just as important today as it was when he wrote it. "Funk to me was just that groove that united everything," he says. "So you could be funky no matter what kind of music you played. There's a funk element somewhere that can be put into it. And the idea of one nation with everybody together [applies to] not only one nation, but one planet." The tour, created by Universal Attractions Agency, coincides with Clinton receiving a Lifetime Achievement Award from the Grammys at a special ceremony on May 11th. It's an honor that means a lot to him, since it's a chance for him to recognize the dozens of P-Funk musicians who've played with him over the years. "It's never been about me or no particular thing," Clinton says. "The whole truth has always been what it's about. As I'm getting ready to get a lifetime achievement award and all of that, there's so many people that's been in the band, it's hard to even pick who all the people are. So people won't get to see a lot of people, but still that award will belong to everybody that's participated in making the P-Funk what it is. It will be for all the people that's ever been through the P-Funk army."